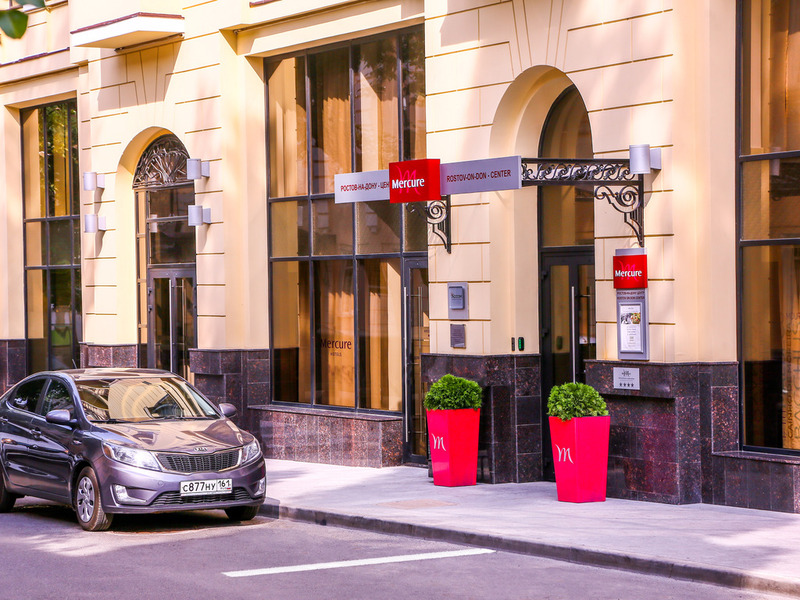 The new 4* boutique Mercure Rostov-on-Don Center hotel is ideally located, opposite the town hall and 547 yards (500 m) from Pushkinskaya alleya, one of the most beautiful and lively streets in the city. 89 specially designed rooms, free WIFI, 3 conference rooms equipped with state-of-the-art video and audio-visual equipment, a restaurant combining traditional Russian cuisine with classic French dishes, and a fitness center make this an ideal choice for business travelers and tourists alike. All of this makes the hotel an ideal choice for business travelers and tourists alike. The stylish and cozy 4-star boutique Mercure Rostov-on-Don hotel is ideally located, opposite the town hall, 87 yards (80 m) from Bolshaya Sadovaya, one of the most beautiful and lively city streets in the city. The hotel has 89 specially designed rooms. The Mercure Rostov-on-Don hotel offers free WIFI, 3 conference rooms equipped with state-of-the-art video and audio-visual equipment, a restaurant combining traditional Russian cuisine with classic French dishes, and a fitness center. Start your day with breakfast, or enjoy lunch or a delicious dinner in our restaurant serving French and international cuisine. Hotel is a good compromise between quality and price, as I had the opportunity to try last year, clean and in the center. The staff always very kind and ready to fulfill the requests of customers. The "standard" room is quite spacious, well finished and without the annoying sofa or armchair that I consider useless as well as difficult to keep clean.Breakfast is of a good standard both in quality and quantity.If you have the chance, I recommend the "privilege" rooms.The only flaw could be the fact of not having parking. No complaints for 3 years of my business trips to Rostov-on-Don and this hotel. Dear Hendrik, Thank you for the great review of our hotel! We are glad that you enjoyed your stay and hope to see you again very soon. Sincerely, General Manager, Kovalchuk Natalya. The staff is very friendly and helpful , all my requests were answered immediately. The main problem that bothered me was the noise from the street outside, mainly motor bikes roaring at nights. Another issue is that the room service menu has a very limited variety of vegeterian meals. The restaurant downstairs has a better choice, and the kitchen is very good. The TV channels are very limited. i didn't have any problems during my stay in hotel. Room was quite big and comfortable. Friendly staff, excellent standard room, big shower, good breakfast but toast in factory packaging. Overall I am satisfied with the stay BUT I was overcharged for my stay. I have already informed the hotel directly and I am awaiting a revised invoice and for the overcharge to be credited to my credit card. This is dissappointing given that overall the stay was good. My stay was pleasant and comfortable. Personnel was polite and complaisant. Only two things bothered me: TV set wasn't configured properly so I could't watch Russia24 channel, oatmeal porridge was sweet, but I would prefer it to be neutral so I could choose myself sweet or salty I want it to be. Fried eggs offered during the breakfast are terrible. We even wrote to customer service, but still no reply. Reception staff also wanted to charge extra money for a second person in a room. While price in Accor app is the same wether you book this room for one, two or even 4 persons. Extremelly disapointing stay in Rostov. Durng all period of my staying I fill comfortable. Thanks to the care of the stuff. Service & attention from the entire Team was excellant again.